Eating right is important during pregnancy. But what you eat plays a major role in your wellbeing and that of fetal growth and development. 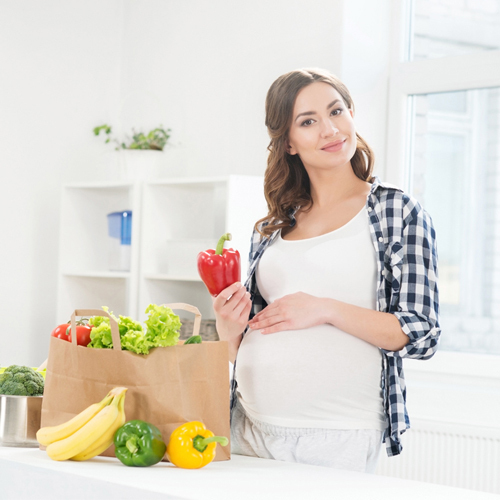 Eating a healthy diet during pregnancy is one of the best things you can do for yourself and your baby. Here are some food for pregnancy. Enriched, whole grain breads and cereals are fortified with folic acid and iron and have more fiber than white bread and rice. Work whole grains into your day: oatmeal for breakfast, a sandwich on whole grain bread at lunch, and whole wheat pasta or brown rice for dinner. Nuts are chock full of important minerals (copper, manganese, magnesium, selenium, zinc, potassium, and even calcium) and vitamin E. And even though they are high in fat, it's mainly the good for you kind. Not only is salmon rich in high quality protein, says Ward, but it's also an exceptionally good source of omega-3 fats, which are good for your baby's developmentÂ and may help boost your mood.